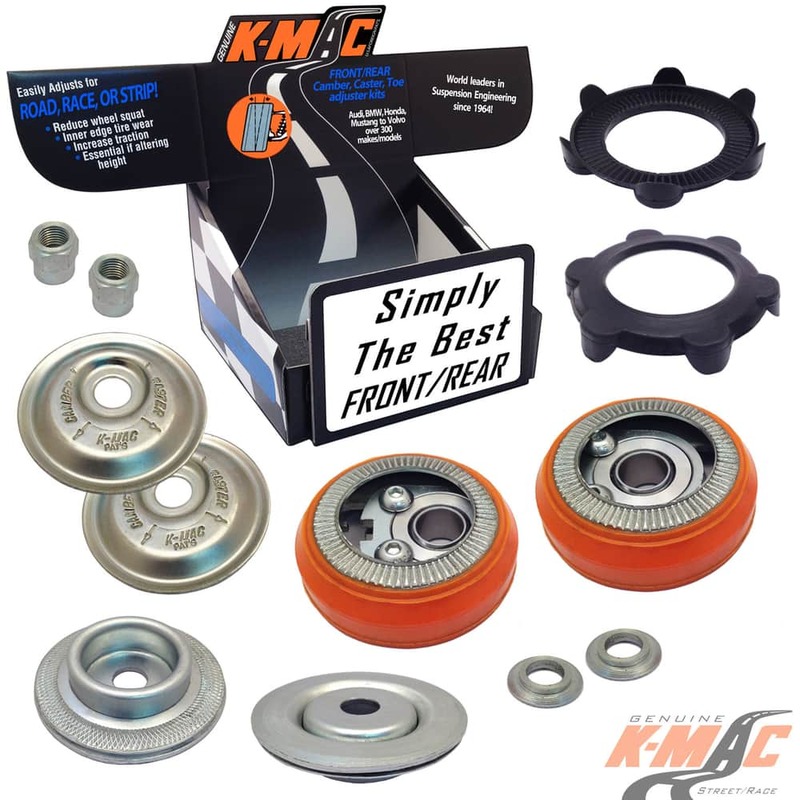 NOT JUST “ONE OFFSET” POSITION – LIKE ALL OTHER BRANDS. 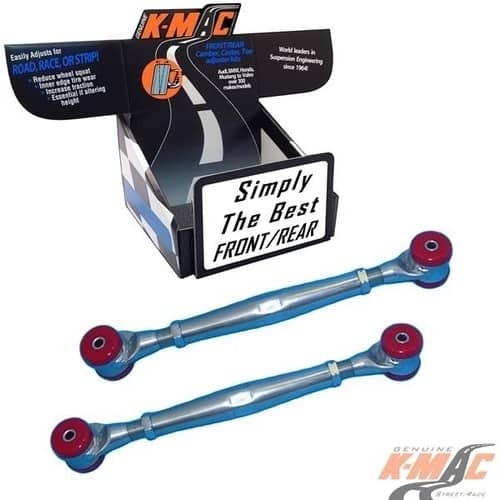 BUT PRECISELY ADJUSTABLE. 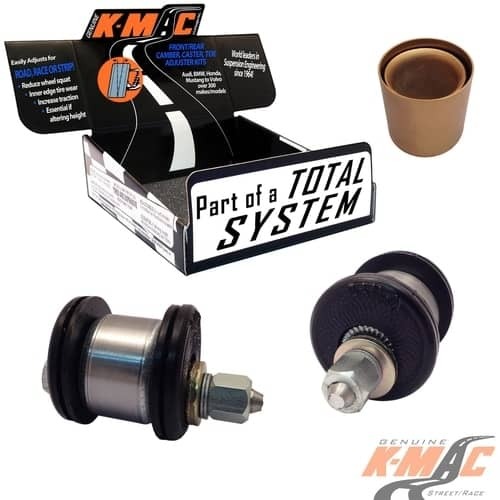 WHAT YOU WOULD EXPECT – THE EXPERIENCE OF BEING THE LONGEST ESTABLISHED ADJUSTABLE STRUT PLATE AND BUSHING KIT MANUFACTURERS AND WITH PROUDLY “IN HOUSE” MANUFACTURE – NOT SOURCING IMPORTS/ RELABELING. ALLOWING TOTAL CONTROL OVER QUALITY AND WITH IT RAPID, CONSTANT DESIGN IMPROVEMENTS (Do appreciate any constructive ideas you can suggest how we can further increase our market leadership). K-MAC invented and is the only manufacturer to provide “precisely” adjustable Camber and Caster top mounts for these models – no modifications to fit and can be adjusted accurately from engine bay. 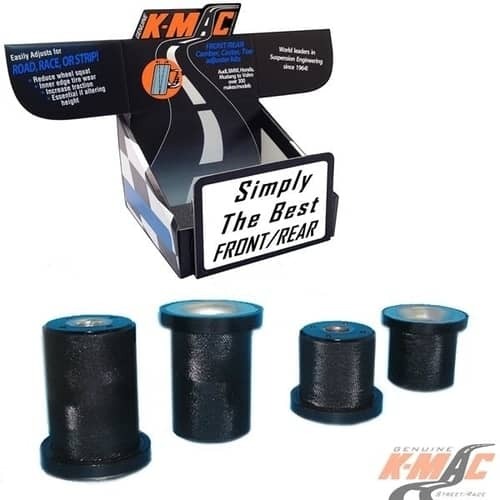 Up to “22mm” (7/8″) of Negative (or Positive) Camber. This equates to ‘1.5’ degrees (+ or – depending on vehicle height. 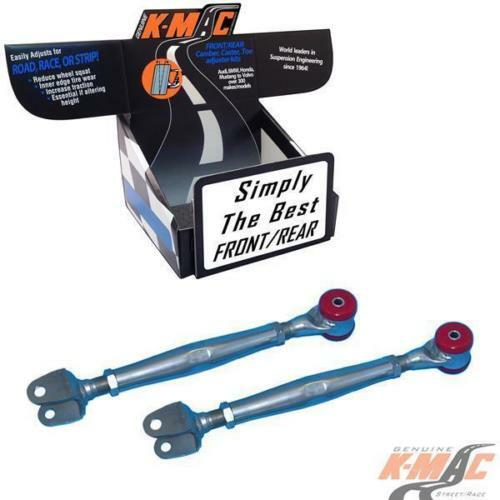 Also see # 201816- 1G ( G8, SS), these are K-MAC LOWER ARM CAMBER ADJUSTABLE BUSHES up to extra 1 degree (plus another one degree available OEM). MAKING TOTAL OF 3.5 DEGREE NEG. This means (in the pursuit of pole setting lap times) on “track days” – dramatic reduction in understeer to hit those “corner apexes” every time and allow to go deeper into the corners with improved traction and braking response. 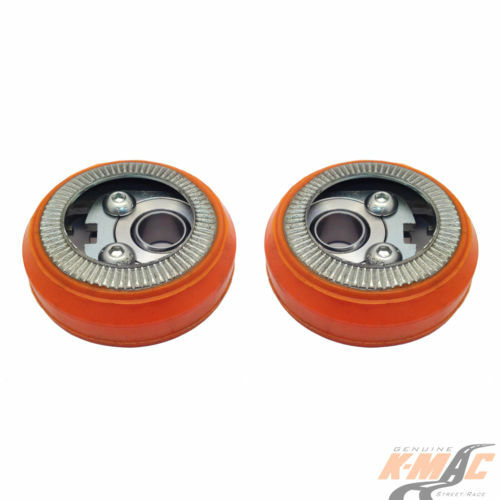 FRONT Lower Arm Inner Bushes. 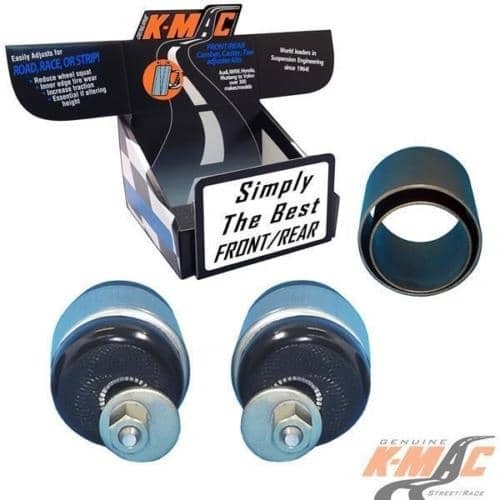 REAR Crossmember Mount Bushes (Full replacement not just wedges ). 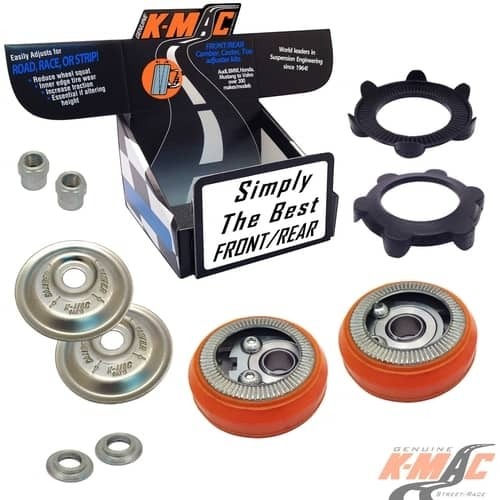 Other K-MAC adjustable strut top design features include the short life plastic encased OEM bearings are replaced with a unique system – extra H/Duty 40mm diameter self align spherical bearings (PTFE lined), then “separate” H/Duty (massive 85mm diameter) full sealed radial thrust bearings for steering loads – also preventing spring drag/binding. Bearings are replaceable for virtual lifetime usage and no height increase. 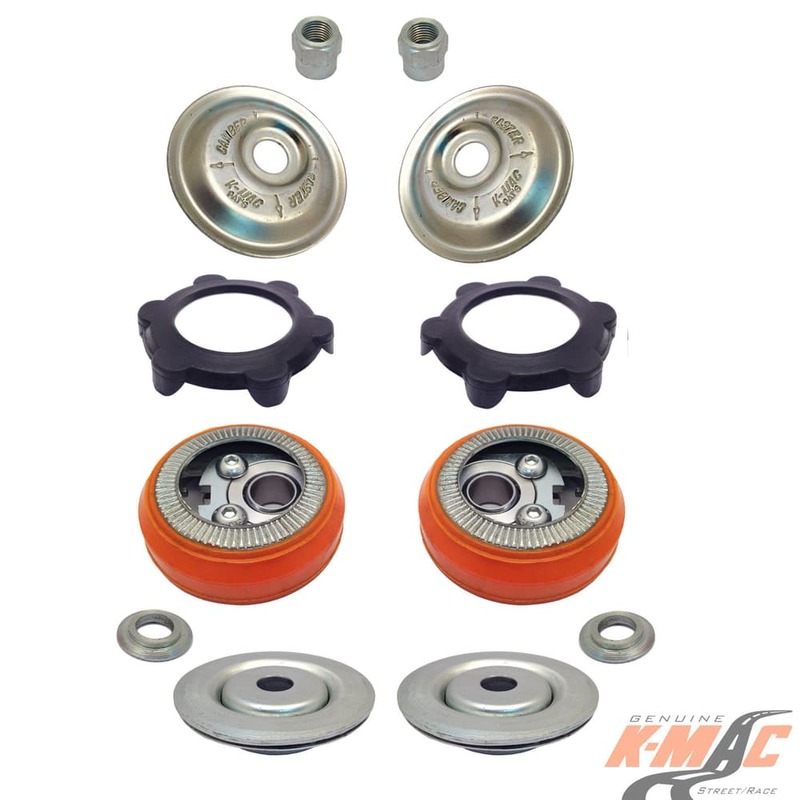 FIT WITH ALL BRANDS OF COIL OVERS – 60 TO 70MM ID AND MINIMAL STACK HEIGHT. 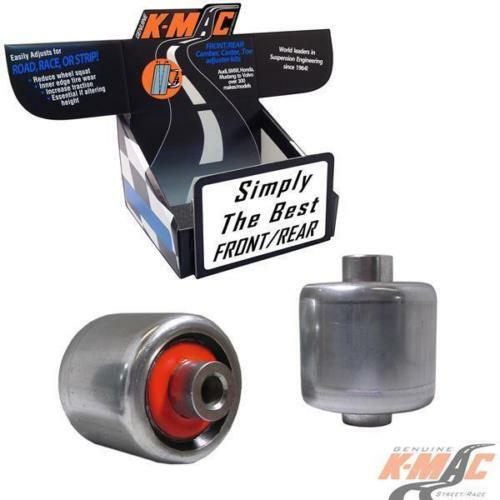 Can Also Use in conjunction with K-MAC front lower arm “bushing kits” – precisely adjustable Caster (thrust arm) bushings that also improve brake and steering response (and for VE, VF, G8, SS models precisely adjustable lower arm Camber bushings that also can adjust to increase track width! ).